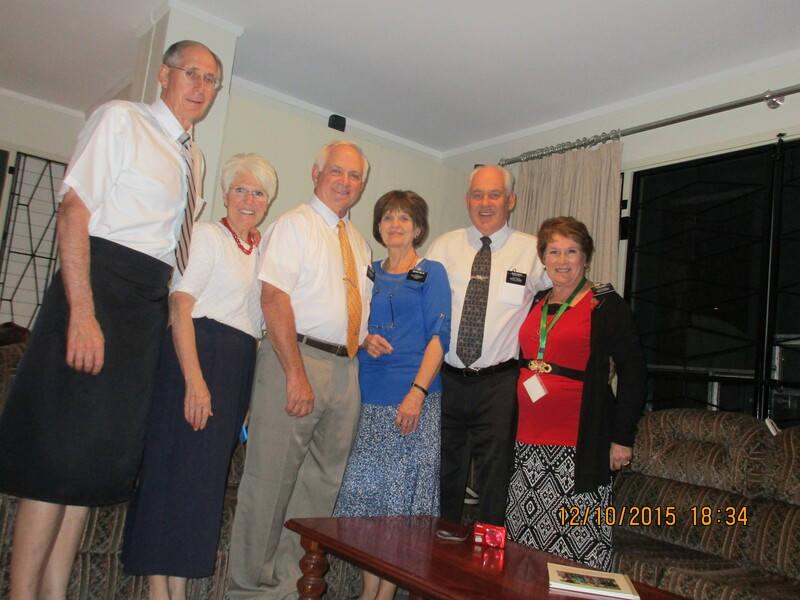 October 12 – 18 – Craig and L'Or L.
We enjoyed having both Elder and Sister Willis and Elder and Sister Smith over for dinner Monday night. 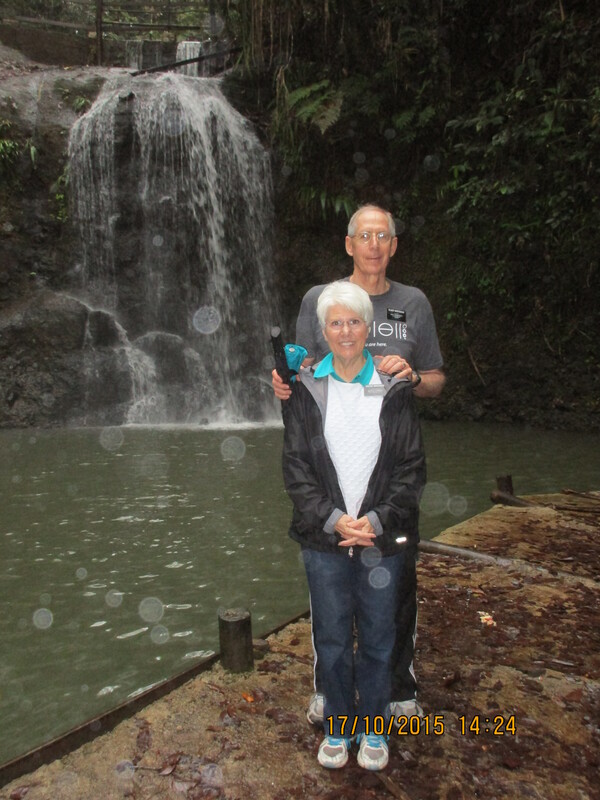 Both couples serve as Self Reliance missionaries, and are passionate about helping members here become more self-reliant. We were told our power would be turned off for two days, and were a little worried about being self reliant enough to cook dinner — but it all worked out, and we had a great visit. 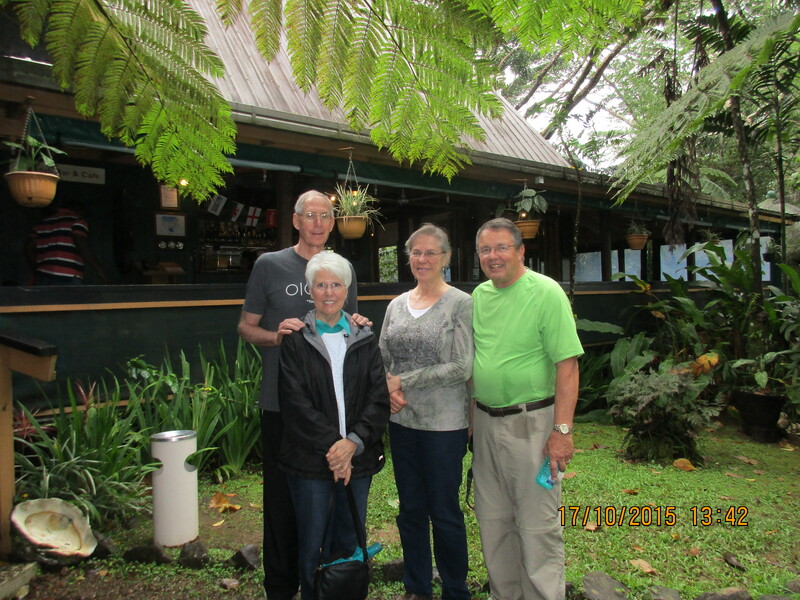 Whiteheads, Willis’ and Smiths, all thankful to be in Fiji. Tuesday we met Tupou, who is studying to become a dentist, thanks to a government scholarship. There is such a serious need for good dentists here. 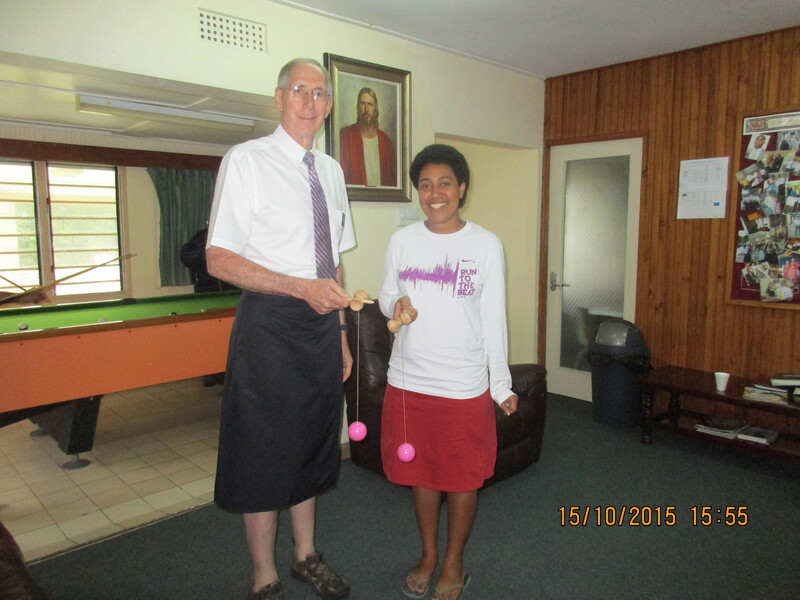 She is obviously not afraid of a challenge – or of taking Elder Whitehead on in a game (which she won!). 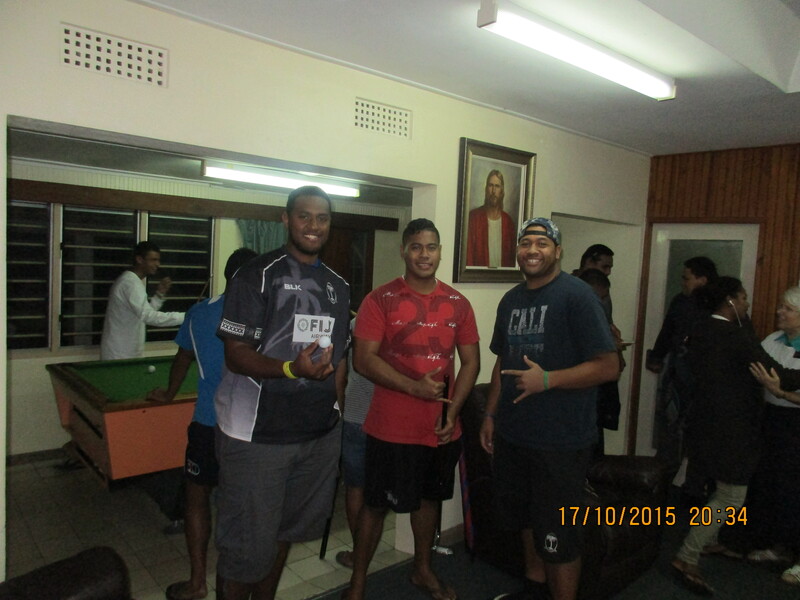 Tupou won at pool, too! Wednesday the temple mural artist and team came for dinner. Linda Curley Christensen is the artist who paints the murals. Her husband Greg, son-in-law Sam, and friend Paul are the team that installs them. We loved hearing stories of their work on temples all over the world. They’ll have a story to tell of their work here, too, because the humidity affected the drying time of the glue that keeps the mural up on the wall. They also shared turning points in their lives, and what brought them all together, It was an amazing experience to be with them. 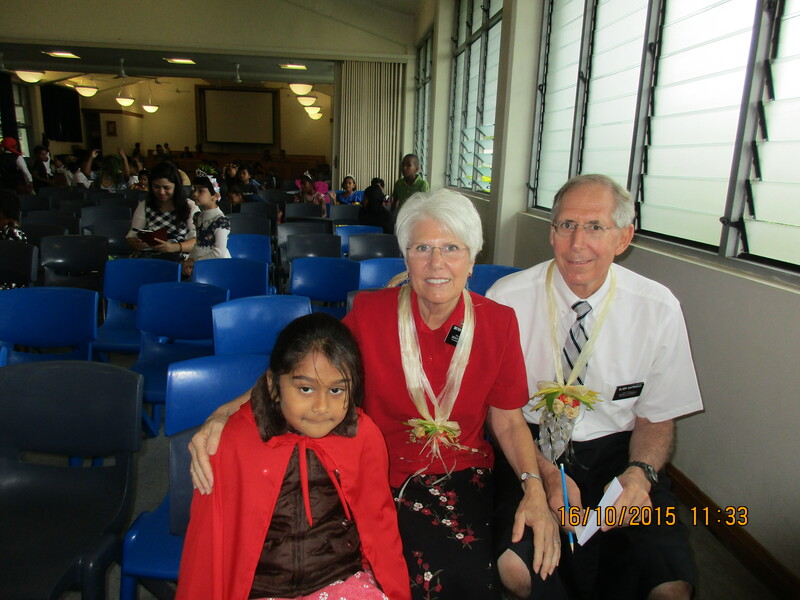 Friday we attended the LDS Primary school’s Reading celebration, where each class performed a skit based on a book. We were asked to help judge the enthusiasm and creativity parents and children displayed as they modeled costumes based on their favorite stories. The blare of the music was matched by the screams of the audience as parents and children paraded up and down a cat walk. It was hilarious! The school honored us by having darling girls tie leis around our necks. Called Vau, the necklace part of the lei is made by applying coconut oil to a special tree bark. The flowers are made fragrant by cooking them (?! That’s what I was told!). 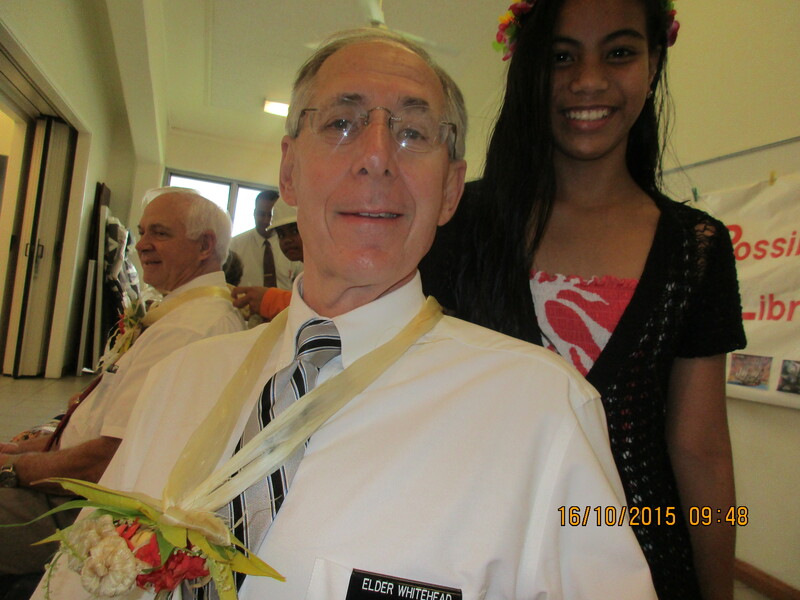 Mocula, the little sister of our YSA Tetika, tied Elder Whitehead’s vau. Izel was Little Red Riding Hood in her classroom skit. During a break during this day long event, the school staff served us an incredible lunch of bundi, cassava banana bread, coconut pie, colorful cakes, and delicious fresh fruit. What a day! 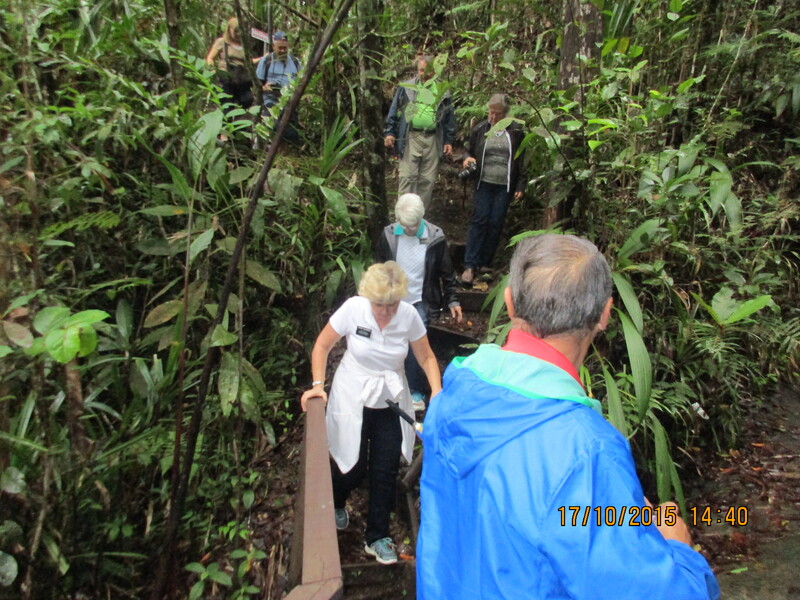 Saturday we went to lunch and then for a hike in the Colo-i-suva rainforest with some senior missionaries, Christensens, and the Nielsons (optometrist and wife from Canada). Wow! What a gorgeous place! We worried that the rain would make hiking too slippery for us old folks, but it was totally worth it. At the Rainforest restaurant with Linda and Greg Christensen, just before our hike. One of the waterfalls along the hike. Over the river and through the woods – a little rain didn’t stop us.from enjoying this little paradise. 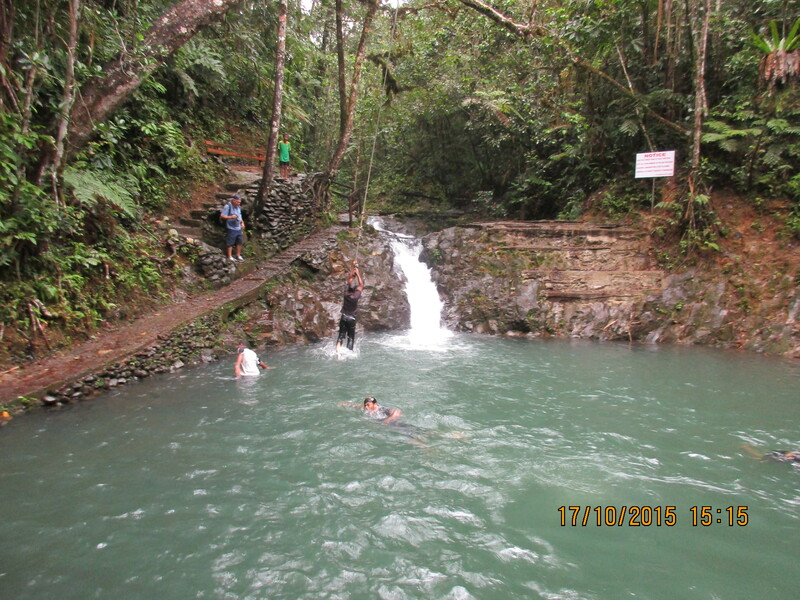 At the last waterfall we watched some kids swing out on a rope and dive into a pool. Saturday night our YSAs laughed all the way through the corny comedy we showed, and then stayed until almost 10 playing games. They have so much fun being together we hate to make them go home. The real comedy was watching these three great big guys (Sean, Ephraim, and his cousin) playing putt putt around the institute. Sunday evening the Academic Vice President of BYU-Hawaii and his wife, Dr John and Rhonda Bell, spoke to the YSAs, youth, and parents. The Bells are touring islands to determine how they can change educations plans to meet the needs in the Pacific. They did a wonderful job talking about preparing ourselves to be an influence for good.